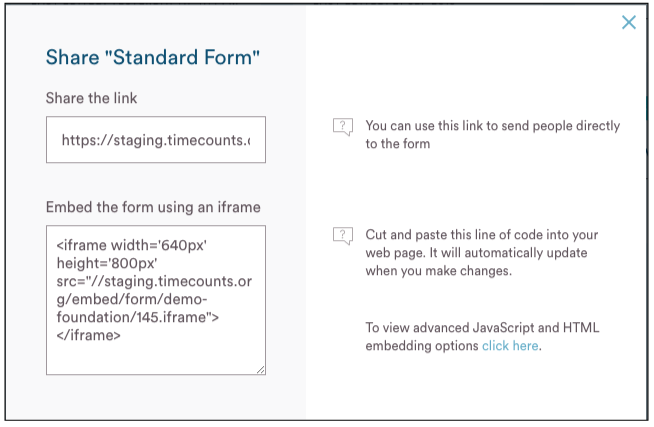 From signups to surveys, the Timecounts form builder is designed for smart data collection. It can be used as a standalone form, or linked to opportunities like Events or Assignment applications. 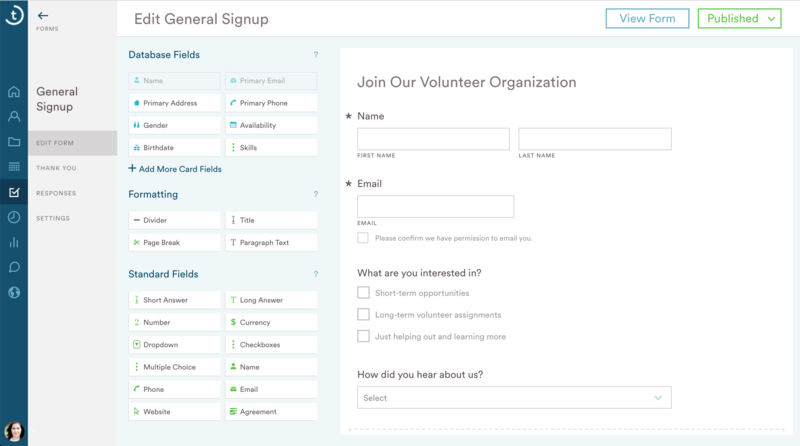 The form builder was especially designed to allow volunteers to have a quick signup. Organizations on the Free Plan will be limited to one 'General Signup' form. On the Premium Plan you can create unlimited forms, allowing you to personalize the signup experience by asking questions that are relevant to an individual opportunity. Let's walk you through step by step how to create and publish a form. To customize your first form, click on the Collect tab in the navigation which will open up to the forms view. You'll notice there is already a default form called 'General Signup'. This form cannot be deleted as it is linked to the Join Us button on your hub and is connected to the membership settings for joining your community. If you are on the Premium Plan and wish to create a new form, click the 'Create New Form' button top right. If you are just getting started, the best place to begin is by editing the 'General Signup' form, go ahead and click on the form and go to 'Edit'. As the General Signup is already in the published mode as it's linked to your hub Join Us button, there are already a few fields to get you started. Feel free to delete or edit those fields to suit your needs. The only required fields on a form are Name and Email as they form part of the Timecounts login. We keep those displayed on the form so you know we are already asking this information. The form builder works with a drag and drop editor, so you can select the field you wish to use from the left side and drag it over to the right side into place. To edit a form field, simply click on the field to open it up. Almost all of the text including titles can be edited, which is helpful if you wish to make your form bilingual or change words your audience will better understand. Add fields from the sidebar by dragging them into your form. Reorder fields by selecting the navigator toggle on the right of a field, and dragging it into a new position. Click on a field to edit it. You can edit the title of a field by clicking and typing in the title area. Make a field required by clicking on the field and checking the 'Required Field' checkbox. Note that volunteers will often skip questions that are not required, so if you really want to know the answer to something, make it required! 2. Start with the basics. Add fields from the sidebar by dragging them into your form. You can start with Database fields like address, phone, social media, emergency contact, and workplace. If you can't find a database field, click 'Add more card fields' to see additional options, categorized by field type. All database fields link directly to the profile card. 3. Add additional questions. Use custom Standard fields to ask for additional information. Standard fields don't save to the profile card directly - instead they appear in the volunteer's form responses, which can be viewed in the 'Forms' tab of the profile card. Learn more about the different form fields. 4. Add formatting. Format your form with paragraph text and section titles. Add divider lines and page breaks to break up your form into more digestable chunks for your volunteers. 5. Customize your Thank You text. In the 'Thank You' tab of your Form is an area to enter a custom message for volunteers to see once the form has been submitted. If you're linking your form to an activity, note that you can override the message for each activity, if needed. Don't forget to let volunteers know when they can expect to hear back from you! 6. Preview your form. See what your form looks like in action, and ensure your fields are arranged as you'd like them to be. Note that any information entered into the form in preview mode will not be saved. 7. Publish your form. When you're finished editing your form, you can publish it. Your form will be saved throughout the editing process, so if you choose to come back to your form later it will remain saved as a draft. Only when you decide to publish it will it be publicly viewable and shareable. Don't forget to Share your form! If you'd like to share your form after you've published it, return to the Forms list page and click on it to access 'Share' options. Sharing the link and embedding via iframe are the recommended options. You can also link your form to an event or assignment. If your form is a signup or registration form for a specific activity, open the activity in Organize and go to the activity Details. 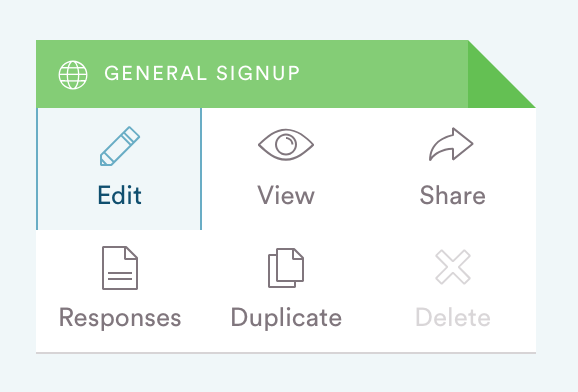 The 'Signup' tab allows you to link a form selected from your list of forms. 8. Check your form settings. If you need to update the name, you can do so in the Settings tab of the form. The name of your form is different from the title - think of the form name as a file name. The form name is for your reference and for volunteers if the form is emailed out. Prevent a field from ever being hidden by checking the 'Ask Every Time' checkbox. Timecounts automatically hides fields when logged-in volunteers have already answered the questions or already filled out the form. But you can make sure all of your volunteers will see a question every time they fill out a form by checking the 'Ask Every Time' box. For example, if you want to use the same signup form for all of your activities, you may want to check the box for the question "Why are you interested in helping out with this activity?" Because if the 'Ask Every Time' checkbox isn't ticked, the second time a volunteer fills out the form, the field will be hidden. Some fields have extra options that can be edited by clicking on them. 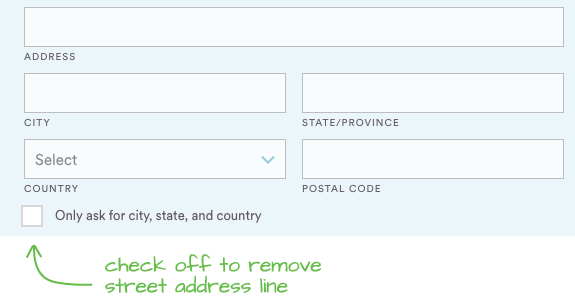 Address allows you to ask for only city, state, and country if you'd like. Simply check off this option at the bottom of the Address field, once you've placed it in your form. Phone and email have opt-in checkboxes that are required by law. You can edit the opt-in text to suit your organization, but it must be clear that by selecting the opt-in box, volunteers are agreeing to receive email or phone communication from you or your organization. Volunteers only need to complete what is new, yet admins can rest assured all questions get answered when signing up for something new or a change has been made to the form. The database fields link directly to volunteer profiles, so you won't have to dig around for updated information. Customizable standard fields allow you to ask questions that are important to you, and advanced form fields sort your volunteers and track their skills as they join your community. You can review form responses in the profile cards of your volunteers throughout the Timecounts platform, making it easy to assign volunteers to the right shifts and tasks. Just click on a volunteer's name and find the 'Forms' tab in the profile card.